Did you lubricate the bearings with a light coat of wheel bearing grease before you installed them. If you install them dry and expect gear oil to get down the tube to lube them while taking it down a straight road, it ain't going to happen. The best way, besides doing figure eights after install, is to jack each side up, so you tilt the axle to get the fluid to go down the tube and into the hub. Then you can drive away and not have to worry about burning them up. yes they were coated with grease when installed. the left inside one still had what I had put on it when installed. the outer there was nothing left of it, even the rollers that were on the side of the road were dry. and not one drop came out of the tube while it was sitting on the side of the road, with the axle drum and tires sitting off the brake shoes once the truck was back at the house and I got things apart. the entire left tube was dry, not one sign that gear oil even went down the tube . the right side bearings were well wet with gear oil . the fill hole on the diff is 1/2 of an inch above the bottom of the axle tubes. where it sits in the drive way is level. it sat for two days before driving it. by all rights the gear lube should have made its way down the tubes. and as I stated I did recheck the level before driving it and when the plug was removed enough came out indicating it to be just a bit over full. temps were in the 40's during the two days. even my buddy Paul who knows how to build and set up rear differentials is a bit puzzled on this. and with this happening with to separate trucks all with in less than 7 months has us both thinking were over looking something. now when it happened on the K20 once the parts were replace I did tip the axle to each side for a good 1/2 hour and have not had a problem with it. at first we thought there might have been some kind of obstruction but we gutted the housing and found nothing . but have not eliminated that possibility yet on the express 3500. When you are doing a full-floating assembly such as this, don't use grease. The lube can't get through it. When you go to install it, first coat your clean bearings in gear lube. Put the hub on the spindle and then use the nozzle of the lube bottle to squirt oil in between the two bearing races to fill them. Then install your oiled outer bearing and spindle nut. When adjusting the bearing I like to have the tire on the hub, as it makes it easier to spin while torquing the nut and you will be able to more easily determine proper endplay. If this design uses two nuts with a lock mechanism in between them, you need to remember to recheck the endplay after torquing the outer nut as it tends to tighten it up a bit and you could end up with preloaded bearings that will burn up early. It can help to jack up each side to let gear oil move around, but I get the best results with the method I used. All the trucks I do use full-floating axles, so I get a lot of practice with it. the right side was fine and the left never got any lube getting down the axle tube. looking at how it's put together it's obvious that the right side has more gear oil being slung at the tube opening. than the left side. and when you consider the fill hole is slightly above the bottom of the axle tubes that there should always be a certain amount with in the tubes them selves. going to make sure there are no obstructions on the left tube. take your assembly steps and as well do a half hour tip to both sides and recheck lube level. thank you for your time and your input. Every bearing manufacturer out there specifically instructs to never use an lubricant like grease on a bearing that is lubed with gear oil. When you do that, the gear oil is unable to lubricate the bearings and they will burn up. The reason 1/2 ton trucks don't have this issue is they are semi-floating axles and a completely different design. Definitely worth checking for obstructions, but the reason one side gets more lube than the other is that the ring gear points to that side. The motion of driving allows the ring gear teeth to sling oil to that side more than the other. Hope you are able to get this one fixed up and on the road reliably. Right out of the service information. 2. Install the outer bearing into the wheel hub. 3. Install the adjusting nut. 4. Install the adjusting nut to the hub using the J 2222-C.
5. Adjust the wheel bearings. 7. Install the axle nut retaining ring. 8. Install the brake drum. 9. Install the axle shaft. 10. Install the tire and wheel assembly. 11. Inspect and add axle lubricant to the axle housing, if necessary. Important: Ensure the brakes are fully released and do not drag. Pull or push the tire at the top back and forth in order to test the wheel bearing play. ^ Use a pry bar under the tire as an alternative. ^ If the wheel bearing adjustment is correct the movement will be barely noticeable. ^ If the movement is excessive, adjust the bearings. 1. Raise the vehicle. Refer to Vehicle Lifting. 2. Remove the axle shaft. 3. Remove the hub adjuster nut retaining ring. 4. Remove the adjuster nut lock key. 5. Tighten the wheel bearing adjusting nut using the J 2222-C. Rotate the hub in the opposite direction to the way the adjuster nut is turning. Ensure the inner bearing and the seal seats against the spindle shoulder. ^ Tighten the adjusting nut to 70 Nm (52 ft. lbs.). 6. Turn the adjusting nut counterclockwise and align the closest lock key slot in the nut with the key way in the axle housing. 7. Install the adjusting nut lock key into the key way in the axle housing. 8. Install the retaining ring. 10. Inspect the lubricant level and add, if necessary. I'm betting the bearing were not adjusted properly. Here is a TSB on it. This bulletin is being issued to revise the Wheel Bearing Adjustment procedure in the Rear Drive Axle sub-section of the Service Manual. 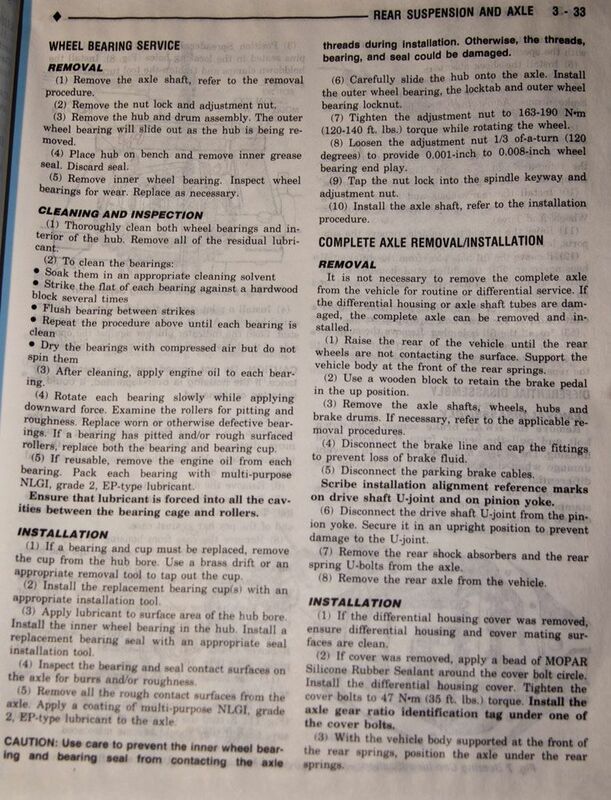 Please replace the current information in the Service Manual with the following information. The following information has been updated within Service Information (SI). If you are using a paper version of this Service Manual, please make a reference to this bulletin on the affected page. Preliminary Inspection Important :Ensure the brakes are fully released and do not drag. Pull or push the tire at the top back and forth in order to test the wheel bearing play. ^ Use a pry bar under the tire as an alternative. ^ If the wheel bearing adjustment is correct, the movement will be barely noticeable. ^ If the movement is excessive, adjust the bearings. Adjustment Procedure Tools Required J 2222-C Wheel Bearing Nut Wrench 1. Raise the vehicle. Refer to Lifting and Jacking the Vehicle in General Information. 2. Remove the axle shaft. Refer to Rear Axle Shaft and/or Gasket Replacement. 4. Remove the adjuster nut lock key. Notice : Refer to Fastener Notice in Cautions and Notices. 5. Tighten the wheel bearing adjusting nut using the J 2222-C.
Rotate the hub in the opposite direction to the way the adjuster nut is turning. Ensure the inner bearing and the seal seats against the spindle shoulder. Tighten the adjusting nut to 70 N.m (52 lb ft). 6. Turn the adjusting nut counterclockwise until the nut is loose using the J 2222-C. 7. Turn the adjusting nut clockwise until the nut contacts the bearing cone. Torque on the nut must be zero to finger tight. 8. Insert the adjusting nut lock key into the keyway using one of the following procedures: ^ If the adjusting nut slot is in alignment with the keyway in the axle spindle, insert the adjusting nut lock key into the keyway in the axle spindle. Important :Do not turn the adjusting nut more than one slot counterclockwise in order to align the adjusting nut slot with the keyway in the axle spindle. ^ If the adjusting nut slot is not aligned with the keyway in the axle spindle, turn the adjusting nut counterclockwise until the adjusting nut slot is in alignment with the keyway in the axle spindle and insert the adjusting nut lock key. 9. Install the retaining ring. 10. Install the axle shaft. Refer to Rear Axle Shaft and/or Gasket Replacement. 11. Inspect the lubricant level and add, if necessary. Refer to Lubricant Level Check. 12. Lower the vehicle. It must be some kind of on going debate. FSM for a Dodge Dana FF. Either way the axle fluid should have ended up in the hub, unless the oil was like molasses in winter time or you do have something obstructing the oil from getting down the tube. If you unbolt the axle shaft and slide out out 1/4 inch and tilt the axle, does fluid pour out? edit: Just read about the torquing. Ya, if you don't preload it correctly it will burn up the bearings. he hee thought you were not going to give your input to this. LOL you just could not help your self. as it was pointed out about the amount of torque in previous reply. it's dully noted. and thank you for not holding my prior comments against me. as well thank you for your time. Your welcome and good luck with that. We'll keep this thread open if you find something else during your repair. It does appear that both the truck manufacturer and the bearing manufacturer seem to contradict each other. DS said to apply grease, and according to the vehicle manufacturer he is right. I said never to do so, and according to the manufacturer of the bearings I would be. Maybe those guys need to all sit down in a room and talk before they release tech info to eliminate the confusion. Most certainly it would need to be verified that lube oil can flow to the wheel ends for continued lubrication. The bearings being adjusted properly is also of high importance. Saw an article in MOTOR the other day about similar differences between both car makers of different brands and spark plug makers regarding the use of anti-sieze. I read that article too and still confused about it...LOL I stopped using anti-seize on plugs after reading the first article on how the grease affects the plug's ability to conduct ignition voltage. Most of my training happens in the bathroom at work. I was under the impression that the issue with anti-sieze is if you get some on the electrode porcelain it will cause the plug to arc back but it's no problem if you are careful and only get it on the threads. well when I drained the diff i did spray it down and blow it out real good. the condition of the old lube was not good. The article in MOTOR seemed to be basing the debate on the chance of overtorque and possible plating of compounds meant to stop seizing. For instance, one brand of vehicle specifically said to apply a little bit to the threads. Another said absolutely none can be used, another said that if you use it, to reduce the torque by 1/3 because otherwise you would be applying too much torque. NGK said not to do it, because they already plate a special metal onto the threads of their spark plugs that prevents corrosion. But Autolite recommended using a small amount, especially on the 5.4 3V Triton plugs. It cautioned to not get any on the ground electrode. If you try doing the plugs on the 5.4 Triton, your lucky streak of getting old plugs out will come to an end. We consider it a success when only one or two break during removal. There are several different tool kits out to get these extracted, so if in the future you decide to attempt one you need to make sure you have that tool with you. If its a job you're doing to make a few bucks from someone, tell them upfront you cannot give them a total labor estimate until you remove all the plugs. Yeah, the 3 valve 5.4 is exactly where I use it. I'm in the middle of doing one now. Up to 3 plugs, so far 2 came out, one broke. Soaking the rest over the weekend. I coat the new ones going in for the next guy.